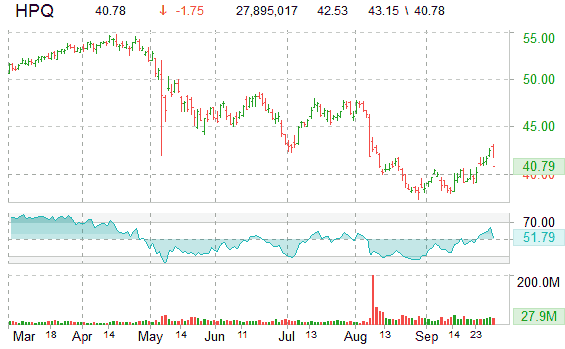 Shares of Hewlett-Packard (HPQ) are getting hit hard after-hours [AH] on disappointment over CEO selection. The technology giant named veteran computer software executive Leo Apotheker as its new CEO, following a two-month-long search for a leader. Shares of Palo Alto, Calif.-based H-P were briefly halted prior to the announcement. When AH trading resumed, the stock plunged more than 3 percent to $40.70. The ticker now is trading $40.30 after closing at $42.07. Mr. Apotheker, who succeeds Mark Hurd — HP’s former CEO who was celebrated for his performance but ousted from the co. on Aug. 6, — served as the CEO of Germany’s SAP AG (SAP), the largest business software applications company in the world. Apotheker is credited with transforming SAP’s research and development operations and its technology platforms. “Léo is a strategic thinker with a passion for technology, wide-reaching global experience and proven operational discipline — exactly what we were looking for in a C.E.O.,” said Robert Ryan, a member of H-P’s board, in a statement. Hewlett-Packard fell $1.35, or 3.19%, to $40.57 at 4:25 pm ET.